The novel is considered a sequel to "Rudin". 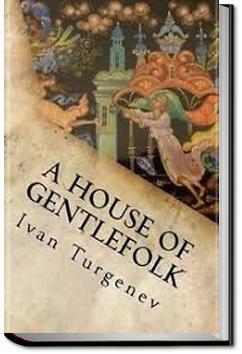 It is the story of the protagonist Fyodor Ivanych Lavretsky, a son of a nobleman and a serf, brought up at his family's country estate home by a severe maiden aunt, often thought to be based on Turgenev's own mother, who was known for her cruelty. . . .I will not abandon you, little bird." Directly Malanya Sergyevna entered Anna Pavlovna's bedroom, she fell on her knees near the door. Anna Pavlovna beckoned her to come to her bedside, embraced her, and blessed her son; then turning a face contorted by cruel suffering to her husband she made an effort to speak. "I know, I know, what you want to ask," said Piotr Andreitch; "don't fret yourself, she shall stay with us, and I will forgive Vanka for her sake." With an effort Anna Pavlovna took her husband's hand and pressed it to her lips. The same evening she breathed her last. Nido de nobles es una novela escrita por Iván Turgueniev en 1859. El concepto argumental gira en torno al típico triángulo amoroso que se estilaba en demasía en esa época, mediados del siglo XIX, tanto en Rusia como en Europa. داستان غمانگیزیه. نقطه قوت کتاب غیر از تصویر قوی زوال جامعه ثروتمند اواخر قرن نوزده روسیه، شخصیت پردازی فوقالعاده و توصیف شخصیتهای داستانیه. آشیانه اشراف فضای روسی دلنشینی رابه تصویرمی کشد.شخصیت پردازی موشکافانه تورگنیف ،ریشه های فرهنگی،تربیتی شکل گیری شخصیتهای رمان رابررسی می کند. Las pocas novelas de Turgueniev que leí reúnen estructuras y recurrencias dramáticas muy similares. Siempre la naturaleza, siempre la presencia digna de los mujiks y siervos, la influencia de la cultura francesa y alemana, etc. Y sin embargo, no me canso de leerlo. "Un cuib de nobili" este un roman care emană melancolie. O boală contagioasă. Paginile sale descriu prima iubire a unui tânăr nobil rus, o iubire care -pentru el- începe cu capul în nori și, psihic, se termină cu capul de toți pereții.